Line 2 12-cup muffin tins with cupcake liners. Preheat oven to 350 F.
Mix cake batter according to direction on the back of the box. To beaten cake batter, add the applesauce and beat a few seconds more until incorporated. Using a rubber spatula, stir carrots and raisins into the batter until well distributed. Spoon batter into prepared cupcake tins. Bake according to the time chart on the back of the box. Remove from oven and allow to cool completely on cooling racks before frosting. Beat cream cheese and butter until creamy, add vanilla and beat until incorporated. Turn mixer down to low and gradually add powdered sugar. When no dry traces are left, turn mixer up to medium high and beat for a minute or two. Spear frosting on cupcake or pipe through a bag. 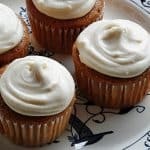 This recipe for Time Saver Carrot Cupcakes was printed from AmandasCookin.com - https://amandascookin.com/time-saver-carrot-cupcakes/ and can only be printed for education or personal use.